Charles Beattie was born in Ingersoll on May 21, 1895. 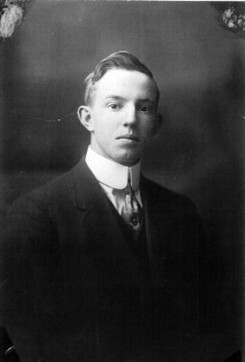 He attended Dickson’s School, and enlisted on January 29, 1916. Charles was a druggist and at the time of his enlistment had served as a volunteer in the 26th Military Regiment. His Attestation Papers (#675433) listed his mother Nellie Beattie as next-of-kin, and that he was a Presbyterian. After the war Charles served with the Brockville Rifles Reserve in 1920 as a lieutenant. Later Charles was company commander as major. On November 10, 1929 Charles was a member of the Colour Party at the depositing of the colours of the 156th Battalion CEF in St. Peter’s Church. On June 4, 1940 the 1st Company of the Stormont Dundas & Glengarry Highlanders went overseas with Charles as company commander. He served in England until he returned to Canada for demobilization.